For the proposed border wall between Mexico and the U.S., it would cost $5 billion. The Sidekick staff writer Anika Arutla explains why building a wall is not beneficial on either side. It is no secret that President Donald Trump’s foundation for his 2016 presidential campaign revolved around building a wall between the Mexican-U.S. border. Two years following his inauguration, the government is experiencing its longest shutdown in history with Trump urging Congress to fund the wall. Is building a wall the most effective way to secure the U.S. border? Securing one’s territory is nothing new. Imperial China built a 13,000 mile long wall more than 2,000 years ago to protect the country from outside forces. Yet, when those nomadic tribes got into China, the system failed. If there was a wall separating you from a potentially better life, would you just stand by or would you find a loophole to get across? Some families live under such horrible conditions, trying to cross becomes a better alternative to sitting idle. If someone wants to get over that wall, they will. Not only does building a wall not guarantee keeping invaders out, but it also has social consequences. The Berlin Wall, built in the 1960s to politically separate two sides of Germany, split families down the middle. Then, in 1989, the wall came down due to the divide it created among the people. Building a wall will not only create a divide among the country’s people but also between the country and other countries that oppose it. In the perspective of other countries throughout the world, the United States under President Trump does not carry the greatest reputation. According to PewGlobal, France is 38 percent favorable of the United States and Germany is 30 percent. America’s neighbors, Mexico and Canada, favor the country 32 percent and 39 percent. Last year, the budget for the United States was $4.407 trillion. Trump has stated it will only take $5.7 billion to build the wall – which is nothing compared to the budget. However, there are environmental risks with building a wall as well. Eight hundred species would be negatively impacted by the border, with 100 of them being monitored for extinction according to Mexico’s National Institute of Ecology and Climate Change and a 2016 report by the U.S. Fish and Wildlife. Mexican engineers are also arguing that the wall will serve as a dam, which can lead to excessive flooding in ecosystems and communities. 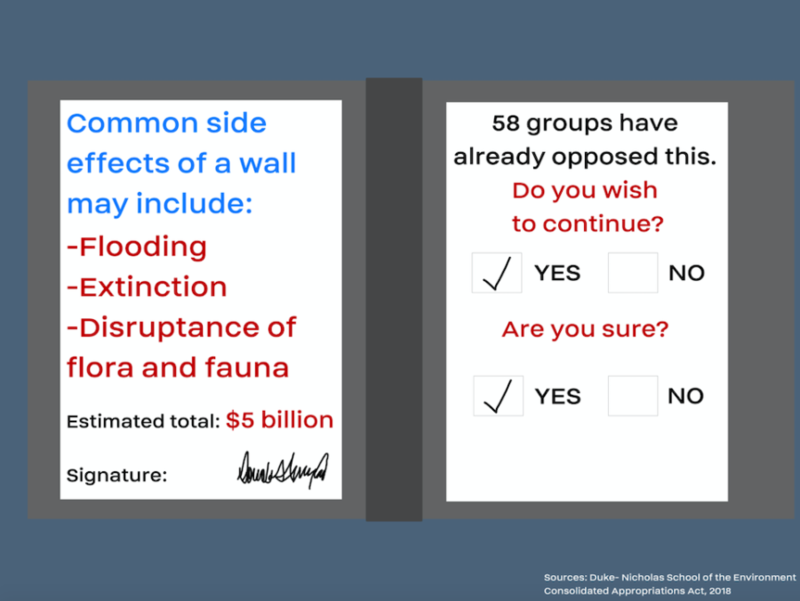 To advocate for threatened species and divided border families, 58 environmental groups, including the Sierra Club, have written a letter to Congress expressing their concern about the negative impact the wall would have. Building a wall will only drive a wedge deeper into this already divided country and could be completely avoided if we found another way to solve our problems such as by implementing more intensive background checks on immigrants and securing the entrances into the United States.